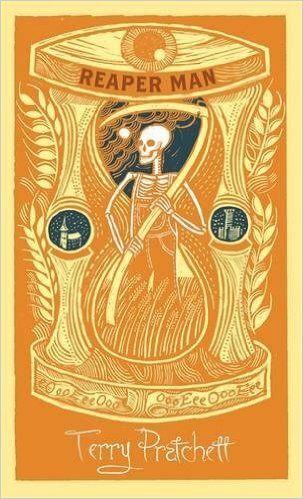 Reaper Man is the story of what happens to Discworld (and to Death himself) when Death is "fired" for developing a sense of self. In Ankh-Morpork, the life forces of everything that should have naturally transitioned start backing up and some souls that should have passed are stuck. Oh, and Death heads to a farm in the country to put his stellar scything skills to use. This is a book that I liked the first time I read it but didn't love. I thought the two plot lines weren't equally compelling. That definitely changed this time through. I loved Windle Poons, the zombie wizard, and his motley band of undead compatriots. I also loved the transformation of Death into Bill Door. The moment when he told Miss Flitworth that he was afraid to die was heartbreaking. There were so many funny and bittersweet moments in this story that I was a bit disappointed when everything resolved. Even the strange snow globe/trolley/mall plot was amusing. Question of the Day: Some of the extra life force in Ankh-Morpork causes head-wizard Archchancellor Ridcully's swears to be personified. They remain in a little swarm above his head and perched on his hat. The word he uttered was unfamiliar to those wizards who had not had his robust country upbringing and knew nothing of the finer points of animal husbandry. But it plopped into existence a few inches from his face; it was fat, round, black and glossy, with horrible eyebrows It blew him an insectile raspberry and flew up to join the little swarm of curses. If your favorite swear word/phrase turned into a creature, what would it look like? My answer? My swear would be slim and white with piercing acid green eyes and terrible teeth and claws and would be shaped a bit like a mink stole, always resting on my shoulders. I'm pretty sure it would growl quietly at just about anyone, friend or foe, that came near me. Strangely, the first time I read this, it was the Bill Door plot line that didn't do it for me. This time, I loved it. And I'm so glad that you have joined in for the Discworld books again and that you're enjoying them! I've read about half of the total books. They're sometimes uneven but, on the whole, the brilliant spots make up for everything. 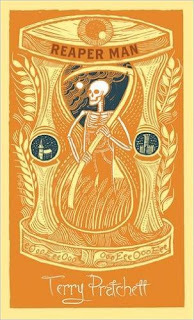 I've only read this the once and at the time I found it one of the best and one of the worst Discworld novels I'd read. The wizards plot did nothing for me at all. I almost hated it. The Bill Door / Shane / Pale Rider plot is one of my favourite Discworld stories ever. The moment when he goes into the burning house actually made me cry. I had that same experience with the wizard plot the first time so I'm glad I read it again. And yes, Bill Door. Such wonderful character development. He truly becomes human. Hm, I did not like this one much on my first reading. I found it the weakest of the Death sequence, more weird than amusing. But maybe it will grow on me with a second reading? I agree with Jean that the Death of Rats is awesome though. I said that the first time too (I just went back to my review and it said this was possibly my least favorite Discworld at the time) but now I thought it was better than Mort. Maybe we need a Pratchett rule to go with Jenny's Law about DWJ?